Fried goodies, originally uploaded by Camemberu. Wow, even from far, I saw this treasure trove of deep-fried goodies displayed in front of a stall at the Geylang Serai Temporary Market called Jemah Corner. Look at the prawn vadai in particular! I could not resist buying a few to try. Mother-in-law wanted goreng pisang (banana fritters), so I got some for her to try as well. Jemah Corner, originally uploaded by Camemberu. 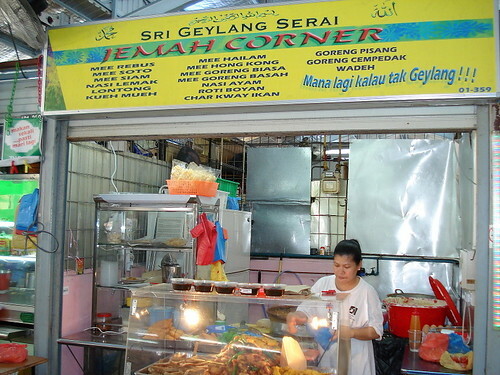 Jemah Corner also sells a few other cooked dishes like mee rebus, nasi lemak, mee siam and lontong but I didn't see many customers lining up for it. 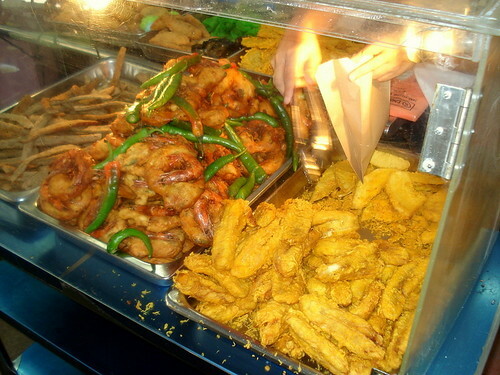 Still, the fried stuff looked irresistible. Prawn vadai, originally uploaded by Camemberu. 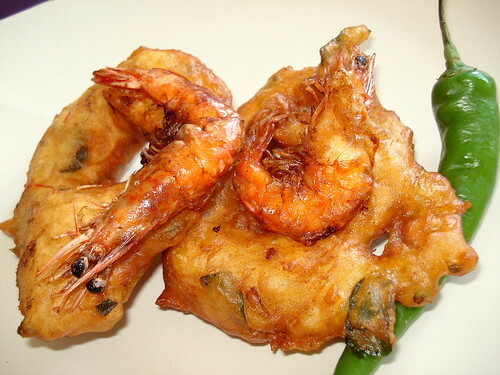 The vadai is huge (a good palm-sized fritter) with fairly large prawns to match! Only 50 cents each! Sure beats Gina's limp and puny versions. So how was it? It's crispy on the outside but reasonably soft and chewy in the center. Hmm, taste-wise not too bad either. I wished there was just a bit more seasoning in the dough - but it did contain a good amount of sweet onions, bit of chili and surprisingly, curry leaf! Plus, it went very well with the prawn. 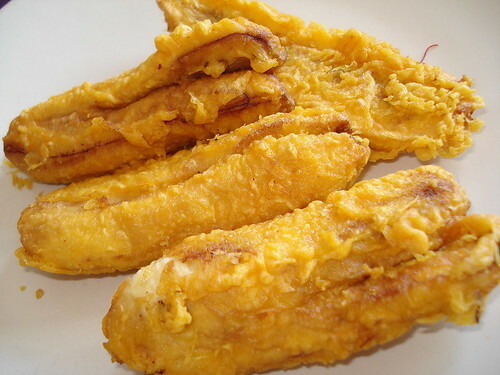 Goreng pisang, originally uploaded by Camemberu. The banana fritters were not fantastic. They used less ripe bananas, so it came out not really sweet and a little too firm. But some people may like it like that. Still, three for a mere S$1. I think the stall holder even threw in a half portion extra for me. Yes, this whole lot you see here cost just a dollar.